In the weekend of February 22nd- 24th 2019, Tallinn will be hosting the 10th edition of the Tallinn Sauna Camp (TSC in short). You are still here… Guess that means you haven’t been to a CS camp before and have all kind of questions about the camping gear required and why the hell would you want to camp in the middle of winter. Don’t worry, we are not camping and actually we are not even surfing a couch either. We have rented an entire hostel again which will be the base for this weekend. The ‘word’ camp just started to get used, gathering or weekend would probably be a better word to describe the event. Anyway, active Couchsurfers around the world organize fun weekends in their home town for other Couchsurfers to enjoy their city in a different way as just surfing someones couch. (A list of most of these events can be found here or here.) And with a big group you can do fun stuff together that is harder to organize by yourself. 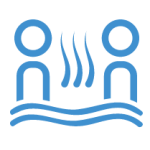 As the name of our event might give away, one of our activities is based around a sauna (be aware, you might see naked people, as there are Finnish, Dutch and German surfers coming 😉 ). Besides that we have the ‘all time favorites’ as a pub crawl, so you can get to know the Tallinn night life. Try one of the escape rooms,, visit a spa, go bowling or shoot some pool. In between, you have plenty of time to have fun with old an new friends from all around the world, as there will always be people in the hostel. Still need something to make absolutely sure you want to join? Check out this video made by one of our participants last year. Now ready to join? We thought so; Grab this chance and sign up for a fun weekend in Tallinn!